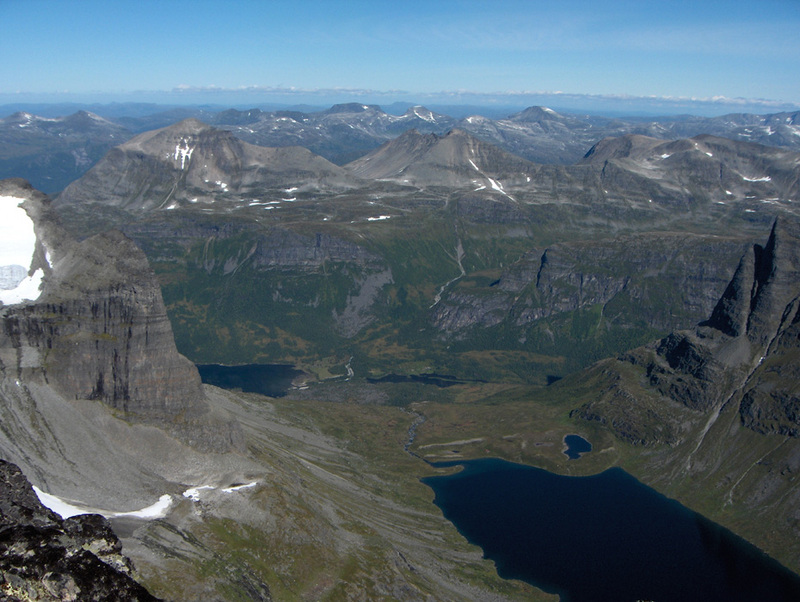 How to get there: This well known mountain is located north of Sunndalen and south of Innerdalen in the county of Møre og Romsdal. The nearest village is Sunndalsøra. Sunndalsøra is located at the very end of a long fjord that starts near Kristiansund. It is well connected to the coast Hwy. E-39 via Hwy. 70 going north-west and to Hwy. E-6 at Oppdal about 70 kilometer east. From Sunndalsøra, go about 5 kilometer east along Hwy. 70 and locate a smaller road forking left, there is a sign saying Hoås. Take this road, after a while you pass a cluster of houses (there is also a road here connecting down to Hwy. 70). As you continue, passing the farm Hoås on the right, drive across a level farming area and cross two "ferister" (metal structure in the road to block animals), then head up a gentle hill. The farm Hoåsbrekka is located on your left just as the road makes a bend to the right on the hilltop. However, there is parking for a few cars on the left side of the road about 50 meter before you reach the hilltop. Park here, elevation 109 meter, location N62:38.846, E008:44.670. Route description: From the trailhead/parking walk downhill about 15 meters and locate a gate giving access to a farm road. Walk along this road (close the gate behind you) as it runs parallel to the Hoåsbrekka farm field on your right. When this road nears its end, continue straight and look for a couple of small cairns that show the way more or less straight ahead (do not turn left). The trail starts a gradual uphill and crosses a second gate (best to just cross the fence next to this gate). You should now be able to follow the small trail as it ascends uphill among the trees. The trail continues steeply uphill climbing the grassy slope that heads up to your left if you face the cliffs above you. 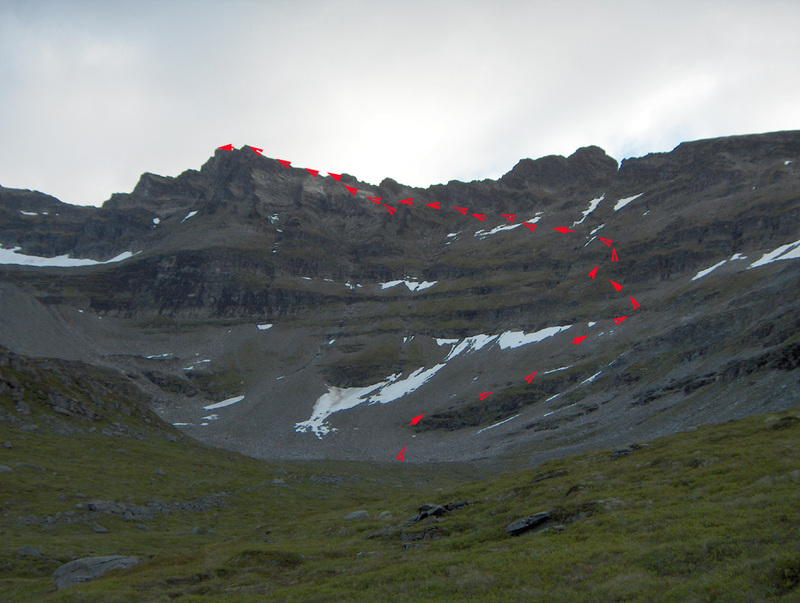 This trail is marked with red paint (dots) on various rocks and continues to climb an impressive 800 vertical meter to a point quite close to the river that comes down from the basin above. 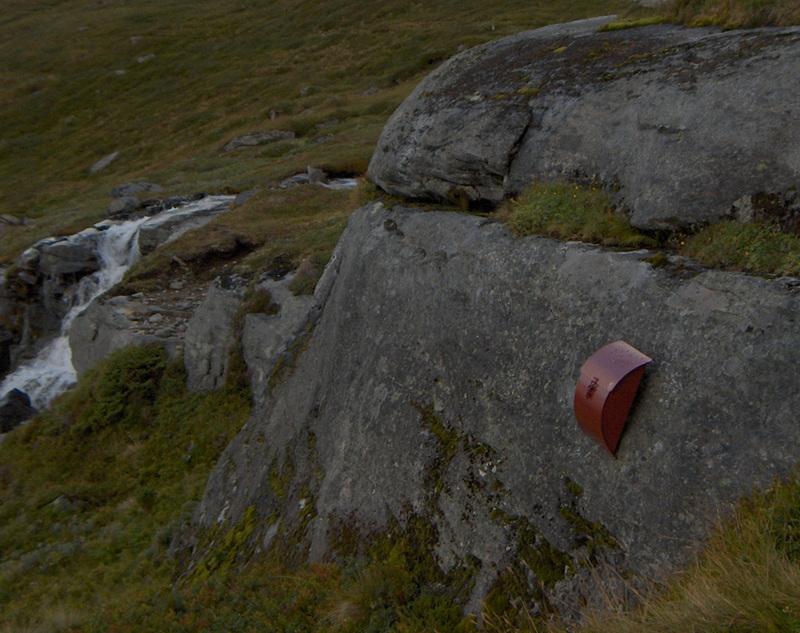 There is a very fashionable (red-brown) mailbox on the rock here. Elevation 920 meter, location N62:39.815, E008:43.662. This is a good place to rest and have some water from the river. 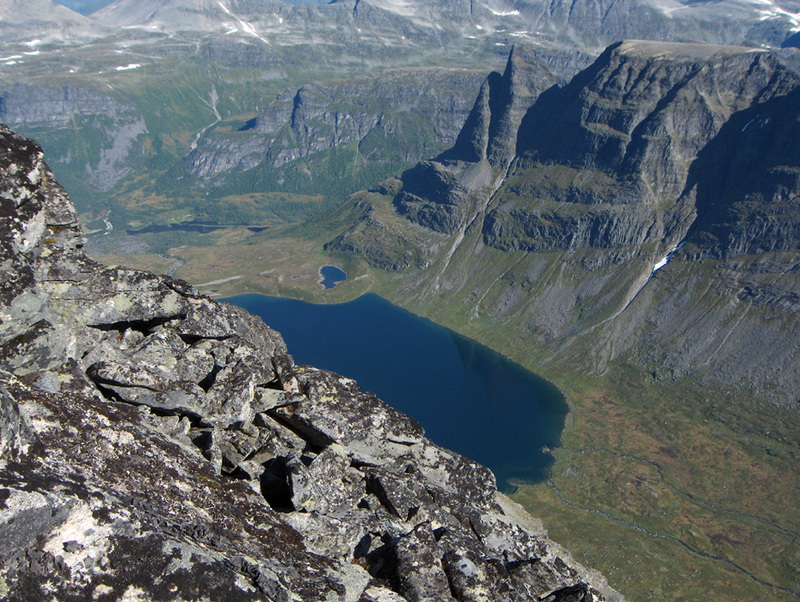 The view of the Sunndal valley is like from an airplane, vertical with farms, houses, roads and the river. At the same time, you now see the goal, Store Trolla, for the first time. It is still more than 900 vertical meter above you. Head into the bowl below Store Trolla, keeping more or less parallel to the river. You are now at the base of the peak. Refer to the route on the picture below for details. The remaining climb can be divided into three parts. 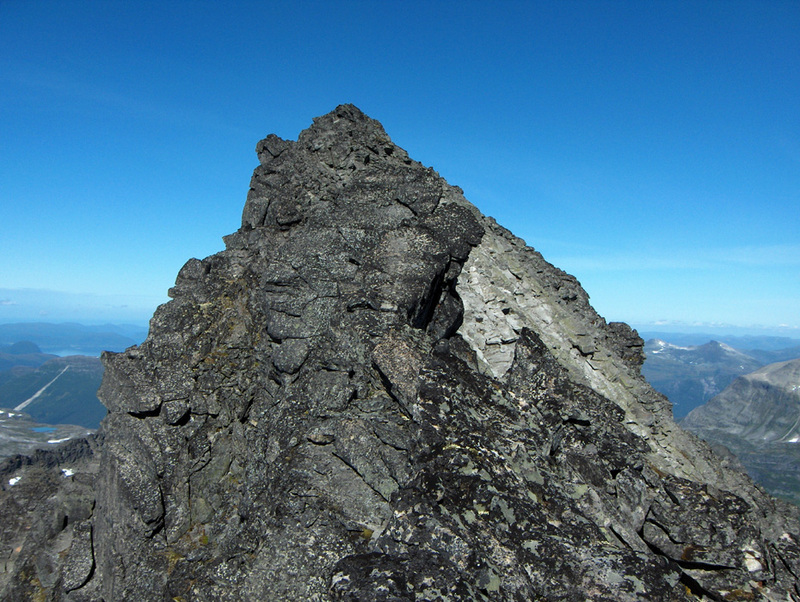 First, from the base to where there is rock, then on rock to the main Trolla ridge, and finally along the ridge to the summit. 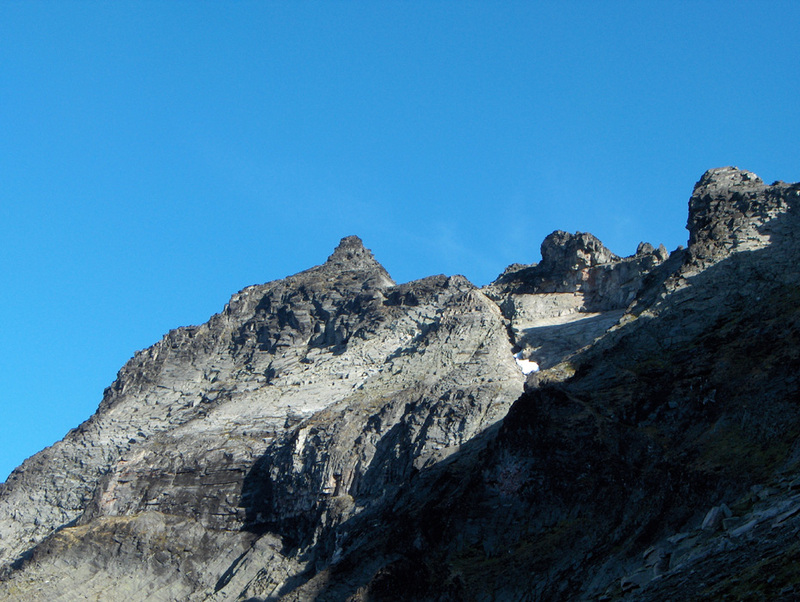 Start the ascent by entering the small moraine ridge that can be seen at the lower part of the picture. Follow this partway up, then head directly up the slope aiming just right of the small patches of snow. 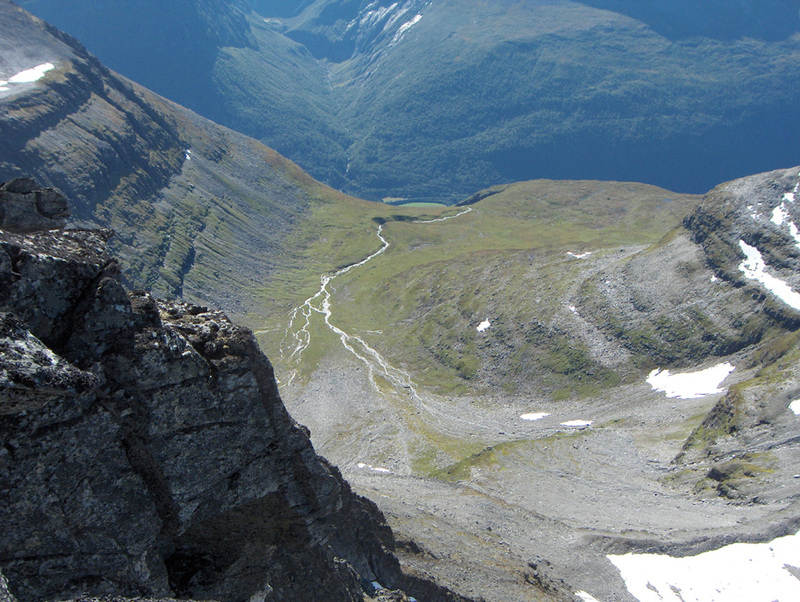 Above here, the terrain is steeper, consisting of a broken system of slightly more gentle ledges connected via somewhat steeper grass slopes and gullies. 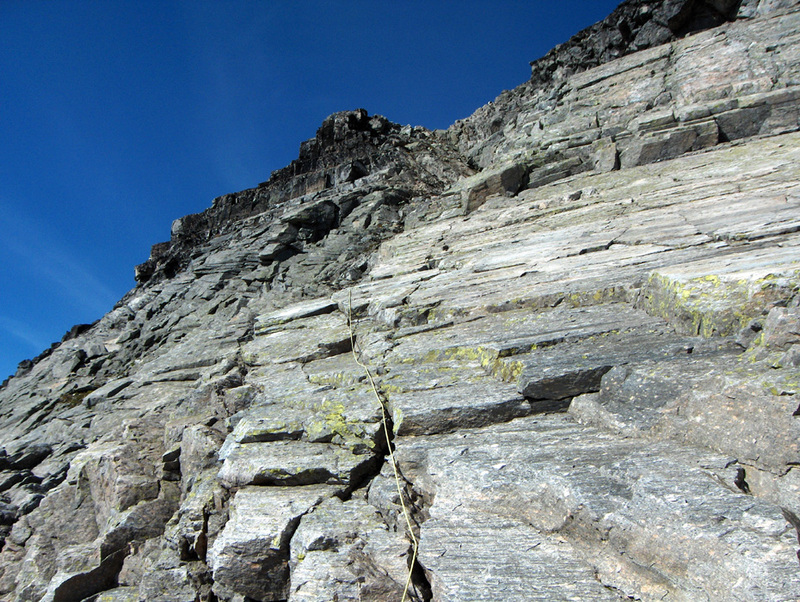 There are also areas of vertical cliffs. Make your way up here, then start an ascending traverse to the left. 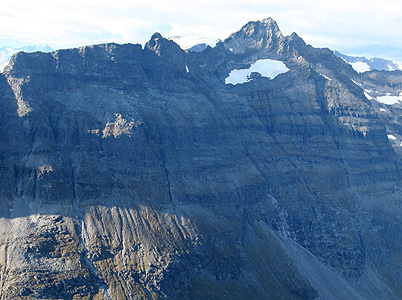 The goal is to connect just below the steeps cliffs that can be seen on the picture. 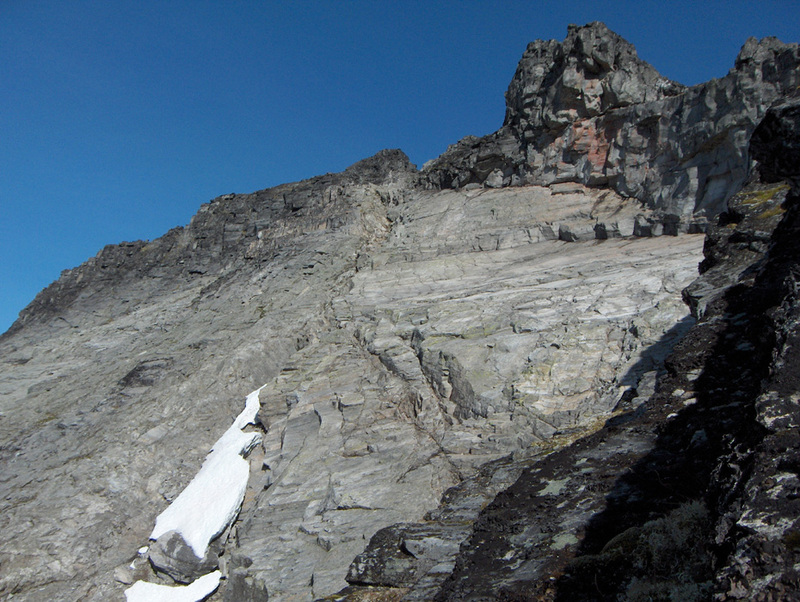 When we were there, a system of three snow patches still remained from last winter and a correct route will pass below the two smaller (upper) patches and above the larger, more horizontallower patch. Again, refer to the pictures below for more detail. The terrain in this part is not nice, steep, loose gravel mixed with some grass and moss, all on slanting rock with some exposure below. Carefully, make your way across and up to a point just below the cliffs above you. 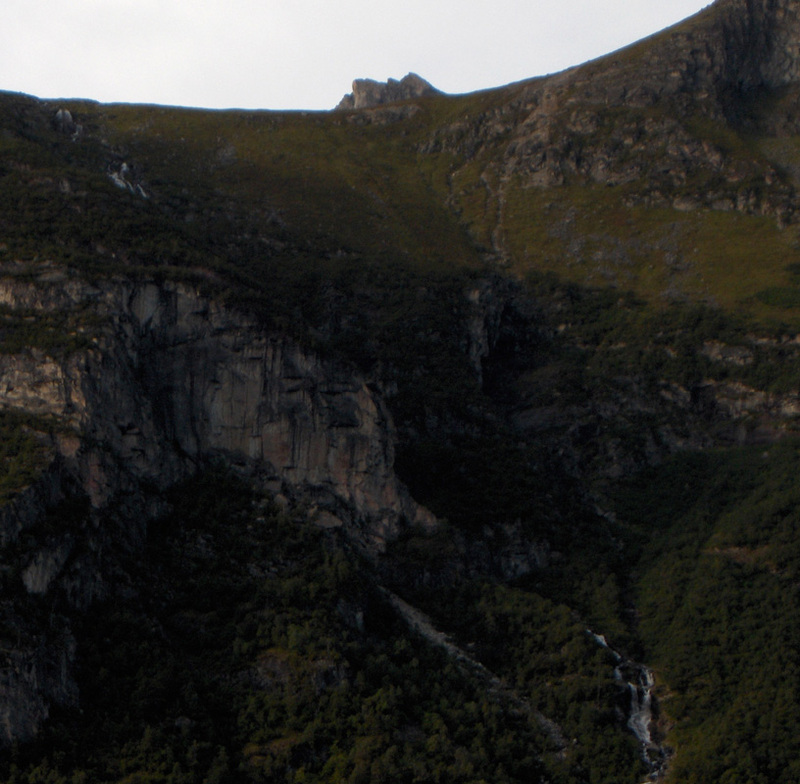 Here, a narrow ledge with overhanging cliffs above connects to easier terrain around the corner. Consult the next picture below for a better impression of the route ahead. Follow a surprisingly nice route just below the cliffs further upwards. Eventually, you will arrive at a spot where a wide ramp continues upwards to your right, while the terrain straight ahead looks more difficult. 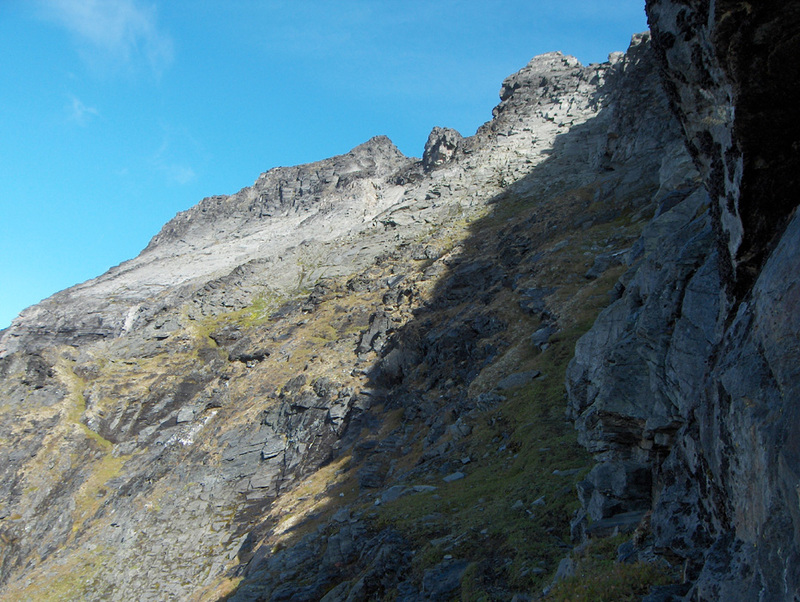 However, upon closer inspection, descend a little (move left), then find easy and good access to the gully below. 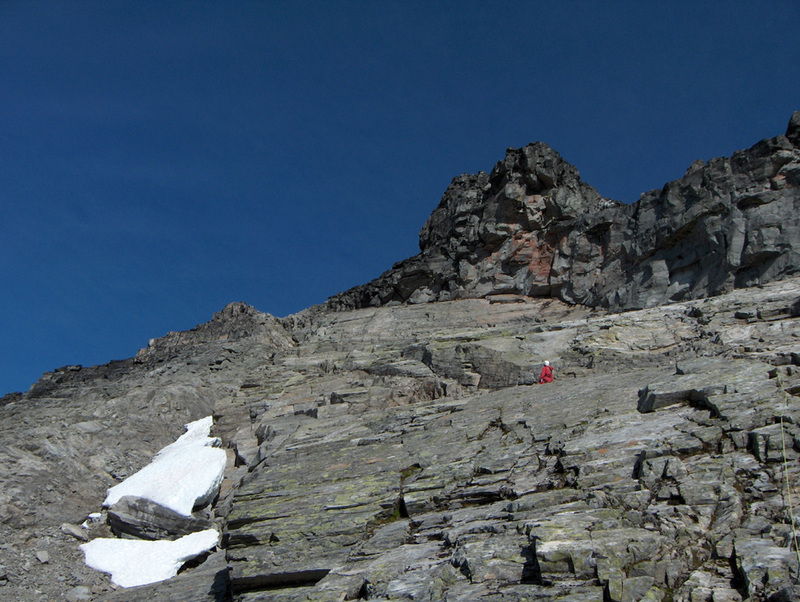 The objective is now to follow a route that will connect with the main Trolla ridge just north (left) of a large gendarme that looms on the ridge above you. 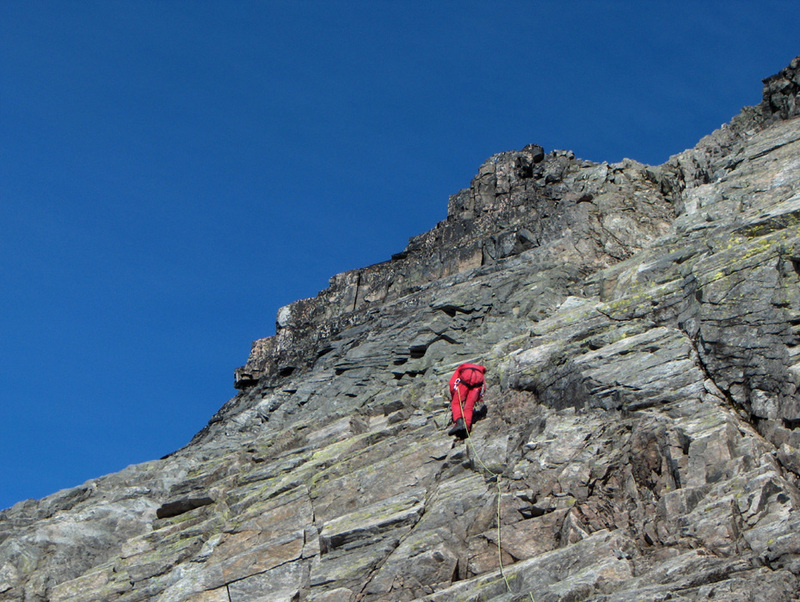 Climb this gully on excellent rock. 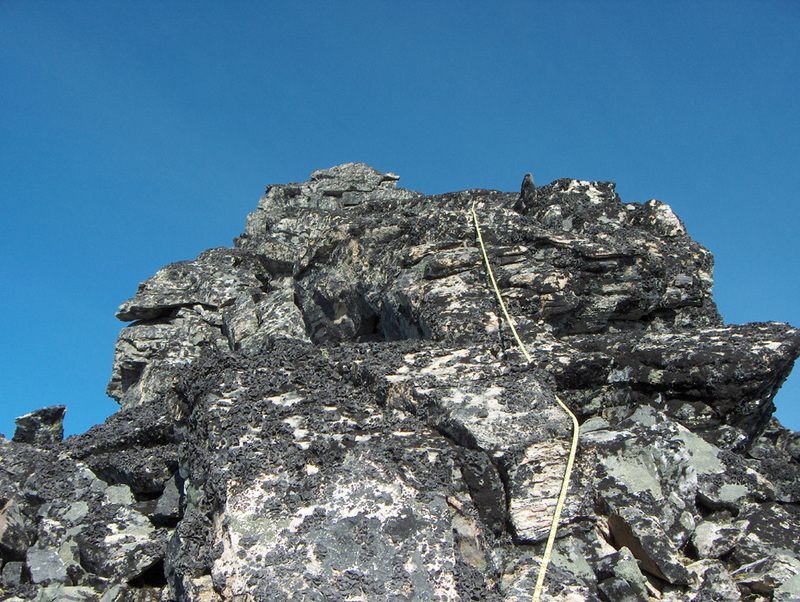 This climbing is easy and the natural route leads you left just below an area of very smooth rock. Traverse the lower section of this rock, dry conditions will provide excellent friction here, there are also small cracks that can be used for hand support when needed. This will get you into a very distinct gully. Climb this gully until you top out on the main ridge connecting Store Trolla with its south summit. The elevation here is 1723 meter, the location is N62:40.873, E008:44.734. 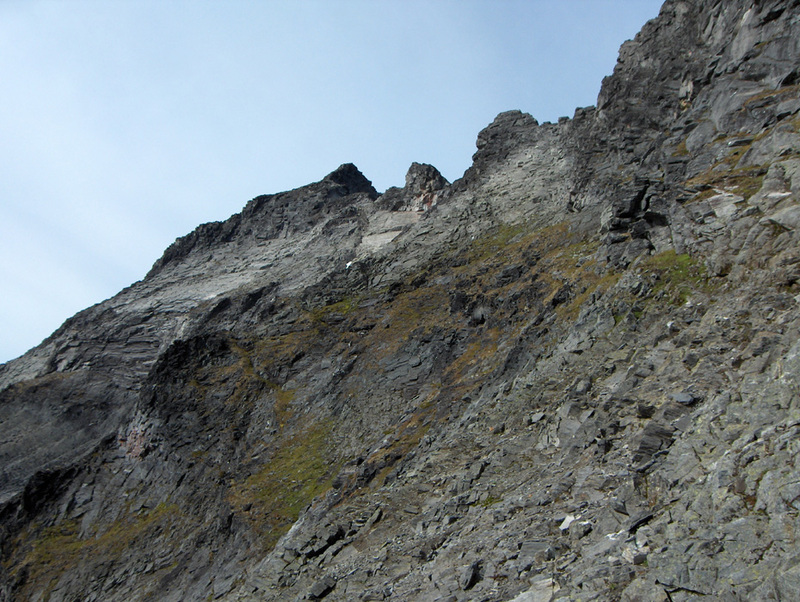 The last section along the main ridge is 300 meter. 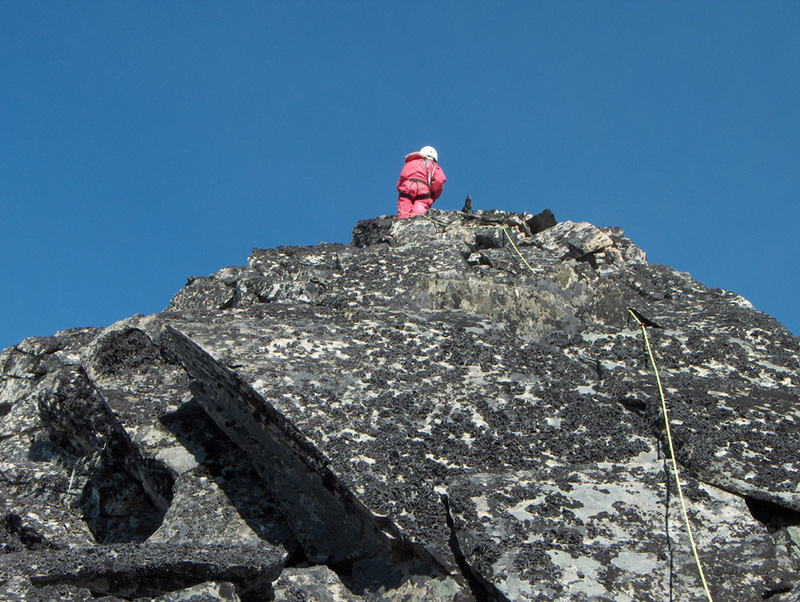 Start out on top of the ridge and continue along the highest possible route until you reach a wider section with rocks. Ascend this gentle slope as it narrows higher up and climb across a narrow point. At the other side, it pays to traverse a short section on the right side of the ridge until you reach a natural point from where to climb up (a small step) and again reach the high ridge. A pretty large gendarme looms ahead. This obstacle is best circumvented on the left side. Downclimb a short, but pretty steep section (YDS class 4) and find a nice ledge that leads forward and up a well protected gully. 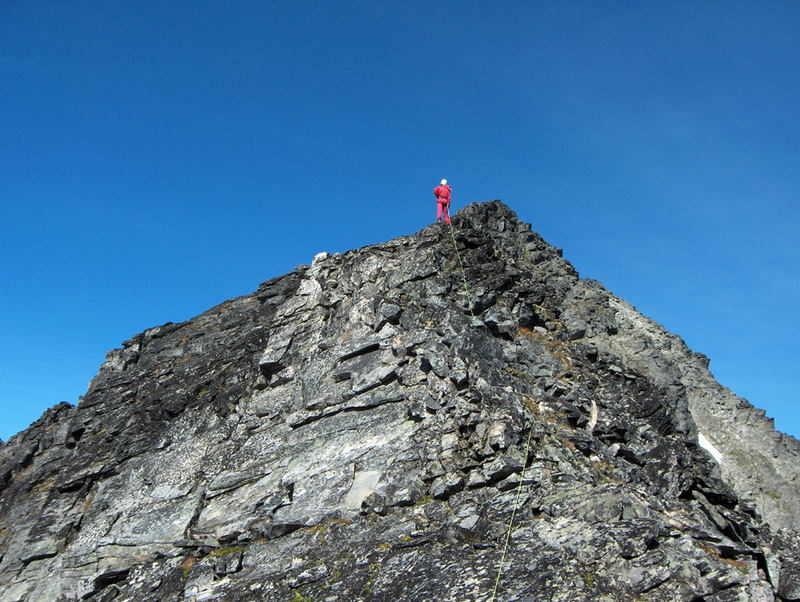 From here, you may stay high, that is on the very top of the ridge for the remaining stretch to the summit. 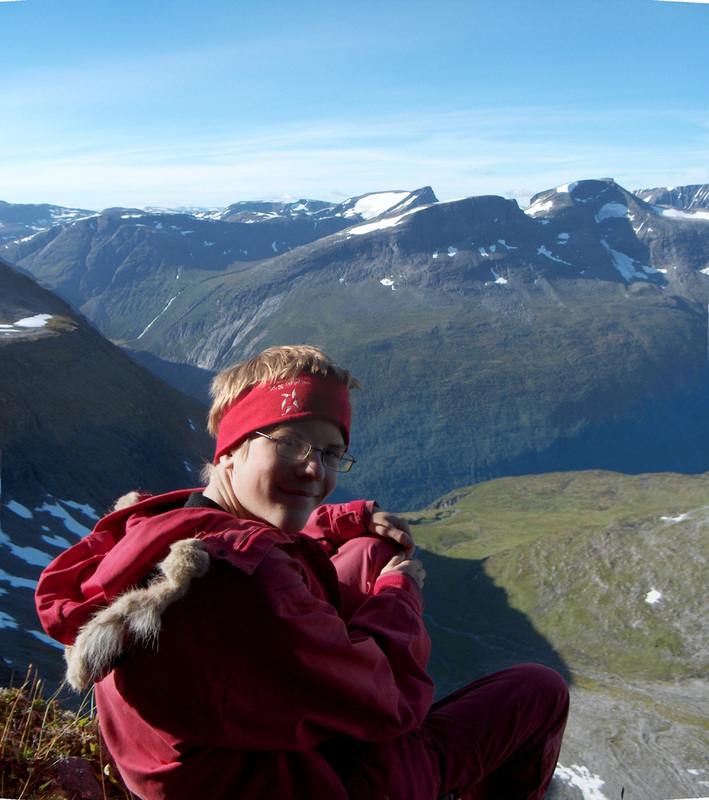 Comments: I did this climb with my son, Pål Jørgen age 16. We travelled to Trondheim by air on Friday, borrowed Tor Erling's car and drove to Sunndalsøra, arriving there shortly after 2000. We got up early and started hiking from the trailhead at 0630. It took us 1.5 hours to reach the mailbox at 0800. After a rest there we continued up the mountain with several short breaks enjoying the scenery and observing that the weather just got better and better. The first part of the climb was easy, but on grass and loose rocks with steeper terrain below. Care is absolutely needed along this section. 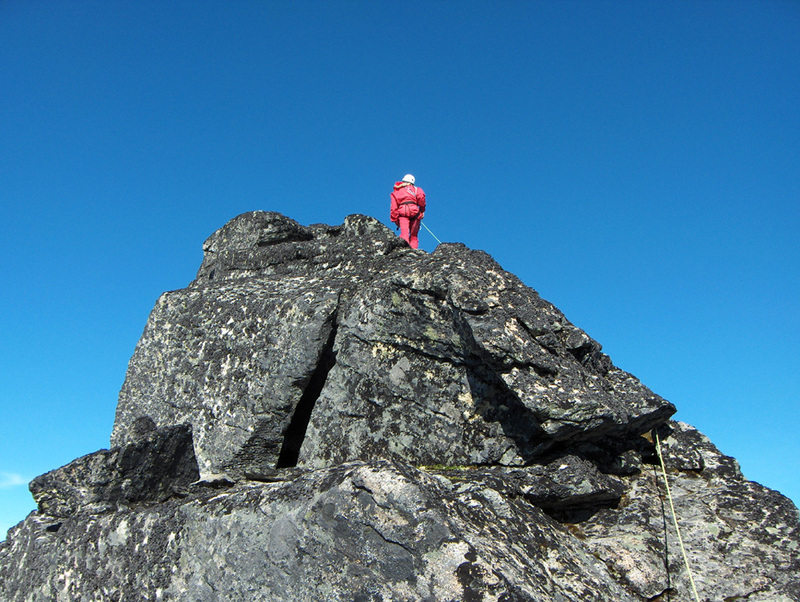 With very little knowledge of the level of climbing required, we roped up just before entering the rock part of the ascent and continued on a running belay. 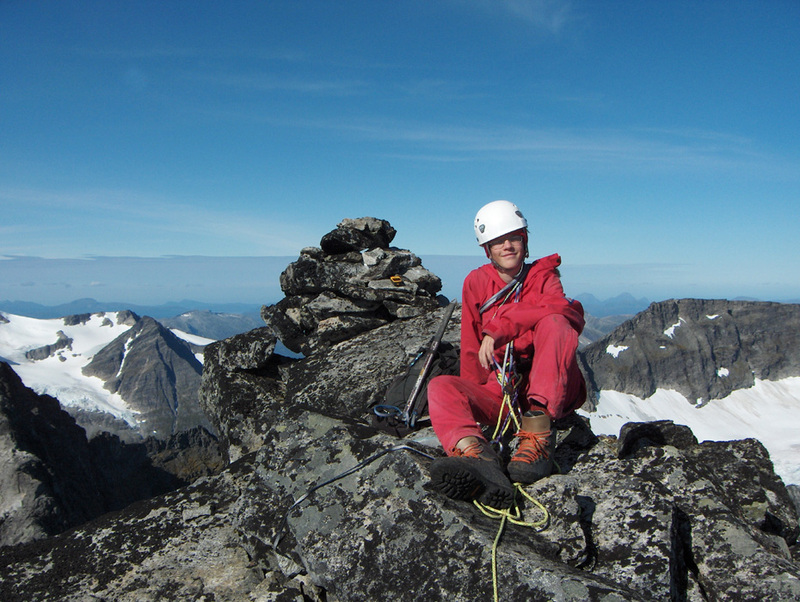 The weather was gorgeous and we took the opportunity to give Pål Jørgen more practice in placing protection along the route. As it turned out, with a couple of exceptions, the climbing was mostly YDS class 3 on good rock and we could have proceeded (faster) unroped. However, we had plenty of time and in this way we ended up spending more time along the verynicest section of the mountain with more time for photography and just looking around on a landscape that captures the mind. We made the summit at 1300, blue sky, sunshine and no wind. A truly unforgettable early September day. Not a sign of any other people in any direction. 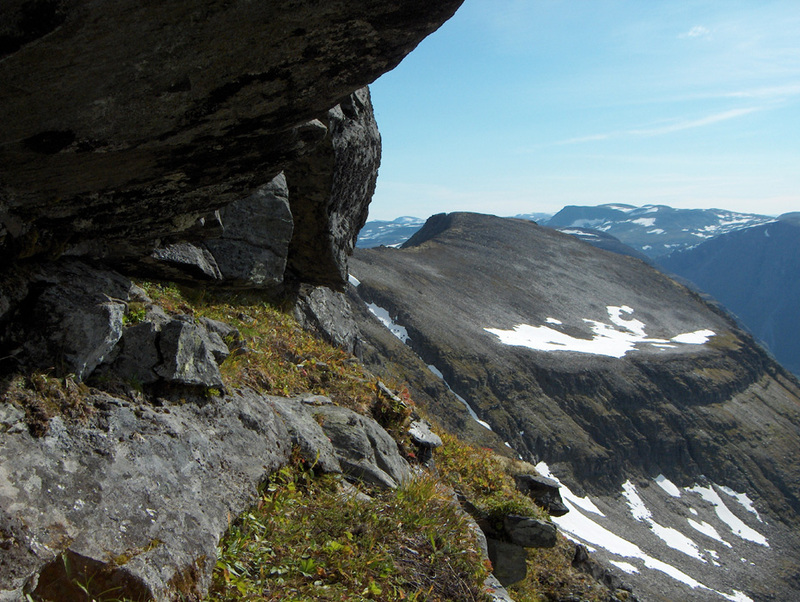 We had lunch and took pictures, then just sat and looked around on the mountain landscape and the deep vallyes. After 30 very nice minutes, I reluctantly and slowly started back down the ridge. We were back at the car at 1830, exactly 12 hours after we left. 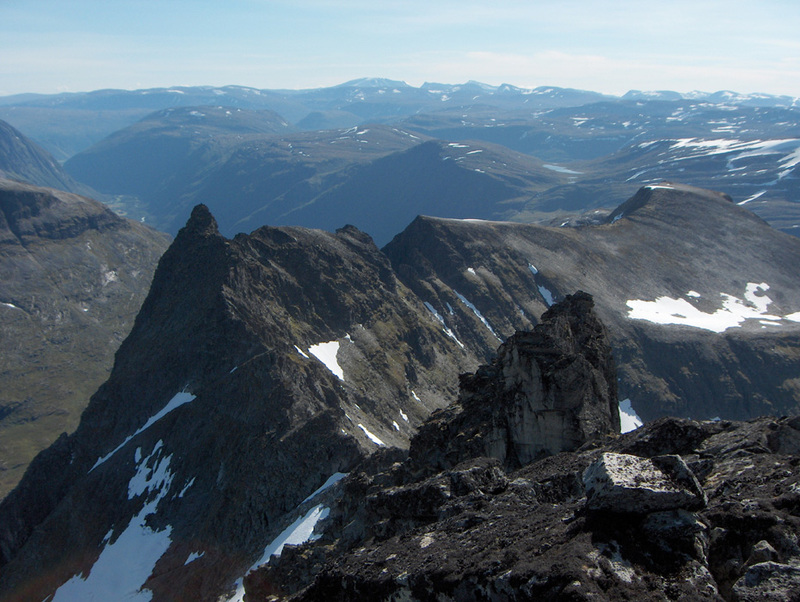 This was my last and final mountain in Southern Norway with prominence exceeding 1000 meter. Store Trolla, as seen from Såtbakkollen in October 2006. Pål Jørgen, a break and good views. enter the gully well above the snow, then to the main ridge. The route now continues 300 meter along the top ridge. Thick growth of lichen covers most of the rocks, this is slippery when wet. This obstacle is best circumvented by a short downclimb on the left. Innerdalen and the famous Innerdalstårnet catches attention on your right. 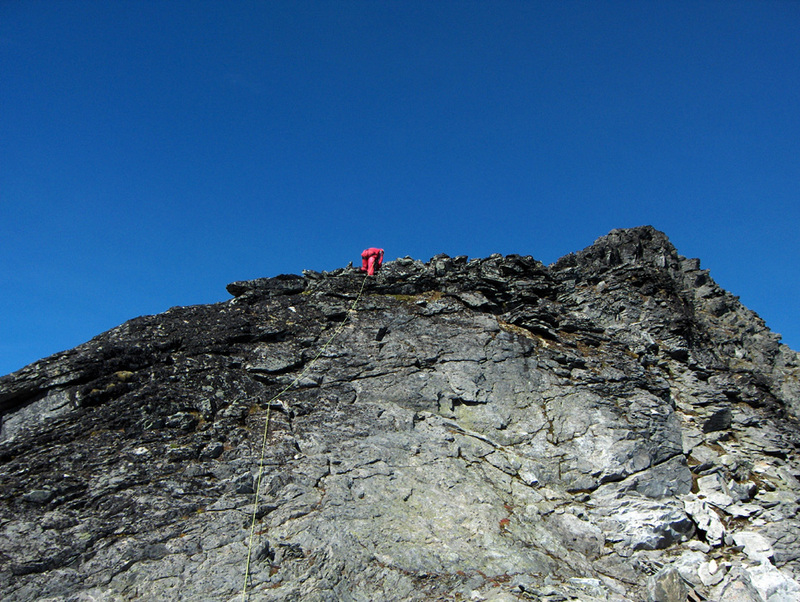 The last stretch before the summit is again along the top ridge. Looking back, the ridge to the south summit. Såtbakkollen, 1840m, (called Tåga on the M711 map). Second highest. 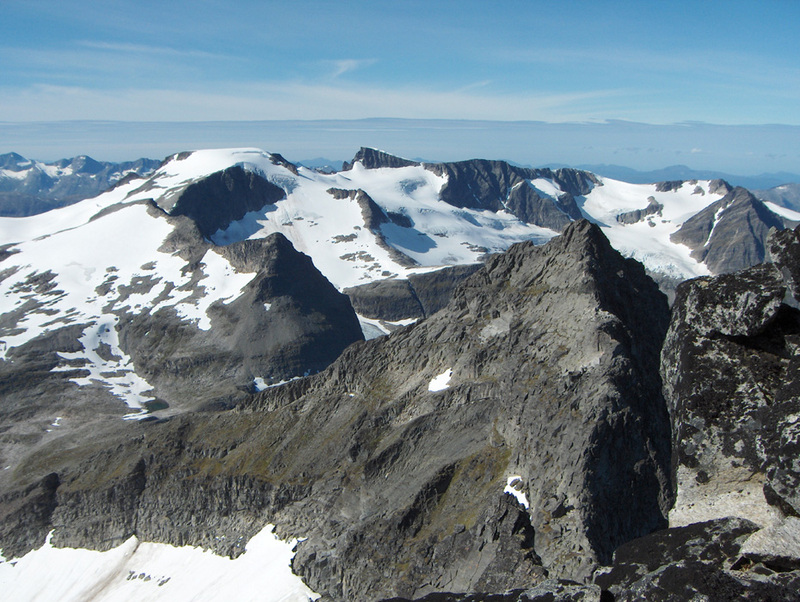 View north, the King crown (1818m), the Queen crown (1816m) and the north summit (1800m). 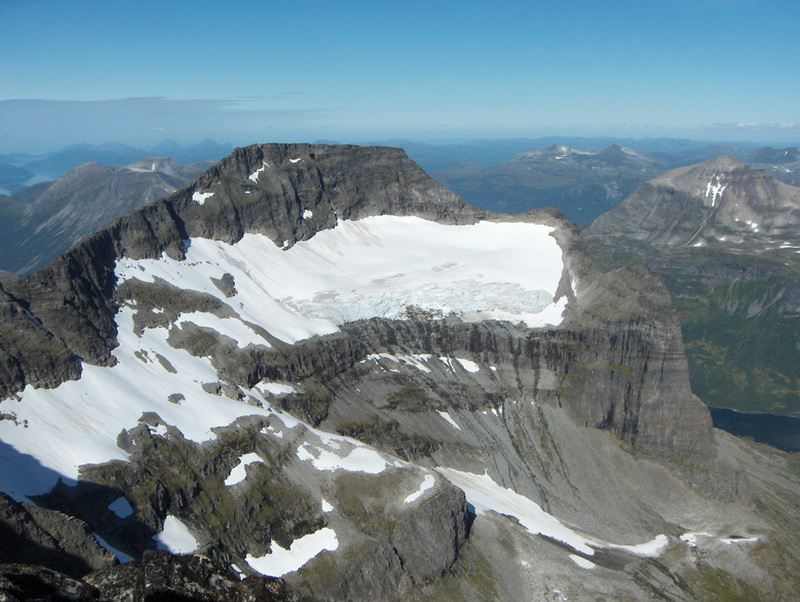 Sunndalen, the only part visible from the summit. 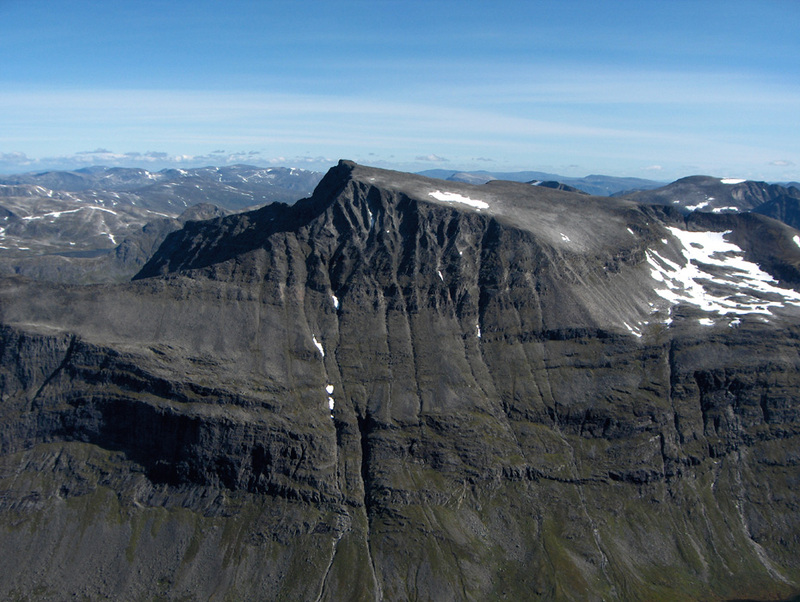 Store Trolla, from Sunndalen (reverse of previous picture). 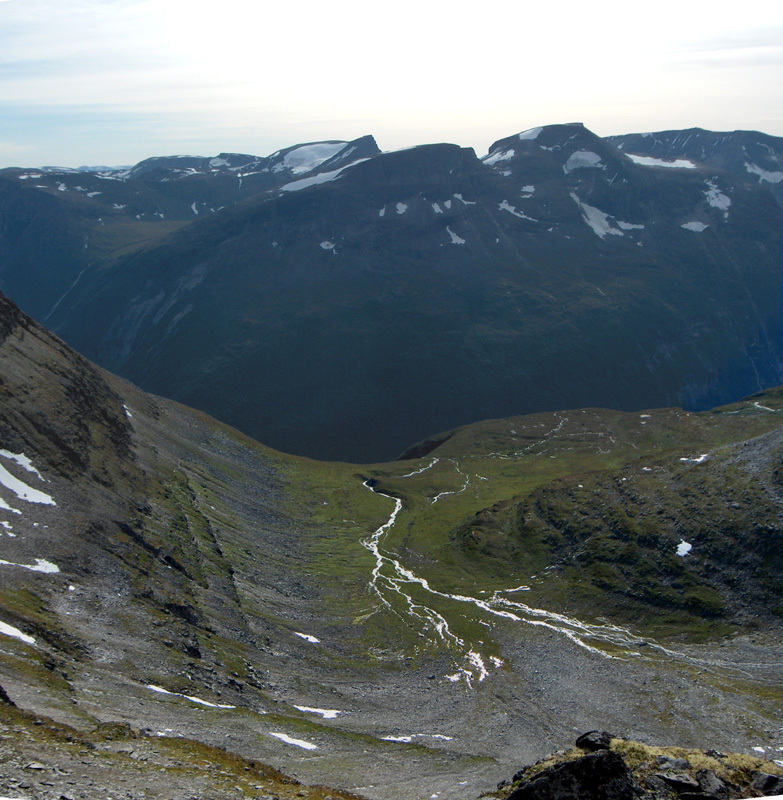 Store Trolla, Panorama annotated by Arild Krovoll.